Click to view inside ! 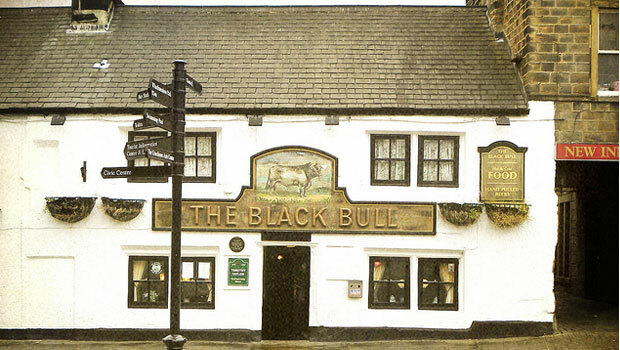 The Black Bull is believed to date back to the 16th century and to be the oldest in Otley. The old picture below shows the mullioned windows which were at the rear of the Inn but no longer exist. Many discoveries have been made in this Inn over the last 40 years. During renovation work in August 1971, workmen uncovered a 16th century stone fireplace that was probably part of the original structure. The licensee and his patrons began a battle to save the fireplace that had been destined to be pulled out in the scheduled alterations. A petition was sent to the owners, Tetley’s Breweries, in the hope that they would recognise the value of such a find. The fireplace was in the room known as ‘the snug’ and for years had been hidden by plaster and a modern-tiled fireplace. Its stones were still smoke-blackened from years gone by. Also uncovered during the same alteration works was an ancient wooden door that had been hidden from both the inside and the outside of the premises. It was dated as old as the fireplace and might have been the original door leading from the Market Place into the building before it became a public house. It was decided it was possible to keep this door as a feature. Another discovery, made during renovation and petitioning off work in 1988, was of what was thought to be a seventeenth century stone fireplace, together with original wooden panelling. The Landlord had decided to look behind some hardboard sheets when the discovery was made. appeared to be still capable of working and the well had been covered by two pieces of Yorkshire Stone which had then been covered in concrete. It is believed that it is the oldest pub in Otley and the pub was allegedly drunk dry by Cromwell’s troops on the eve of Marston Moor.